Tilapia (various species and hybrids of the genus Tilapia) originated from Mediterranean and African countries and has been successfully cultured throughout the world in temperate to tropical regions. Within the last few years, in the United States has exceeded freshwater trout. Tilapia is a hardy fish that will thrive in outdoor ponds or high-tech tank systems using several different filter types to cleanse and recycle water. The fish is fed high-quality, grain-based pellets to produce a mild flavored fillet. Florida has a wild fishery of tilapia found in Central Florida lakes and Tampa Bay's brackish water estuary that are sold in regional seafood retail shops as fresh, gutted fish. Similar in appearance to bream, tilapia are produced with a wide range of skin colors, black to dark blue to brilliant golden red. Much of the tilapia production in the United States is sold to Asian buyers as a live product, which is generally harvested at 1 to 1 1/2 pounds. In a shallow dish, combine flour, salt and pepper. Season fish with salt. In large skillet, melt butter over medium heat. 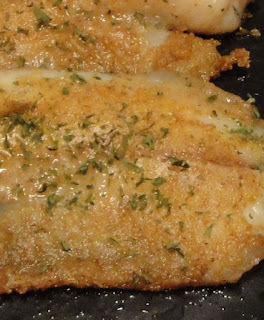 Dredge fillets in seasoned flour on both sides and place fillets in skillet. Lower heat to medium low, cook for 2 minutes. Turn fillets and cook another 2 minutes. Add lemon juice to skillet. Transfer fillets to serving plate and carefully pour the sauce over the fillets. Sprinkle with parsley, salt and pepper. Serve immediately. Enjoy! Note: Fish is cooked when it easily flakes with a fork. Tilapia is my MIL's fav fish! This looks great, Christine! I really like tilapia, but need to dress it up more--this is just the recipe! The fish in the photo looks fantastic--and so moist. Classic, can't fail recipe too! Hi Christine, I make tilapia the same way but in place of white flour I use chana daal flour. this taste best when shallow fried. BTW-I have some awards, waiting for your to claim on my blog. Thank you so much, Elisabeth! I truly appreciate it. Tilapia is a great, white, mild fish. So good to use with different seasonings and flavors. Have you ever had Orange Roughy? I poached a couple of filets last night, and they were great. It's also a white, mild fish. Thanks for your recipe--definitely a good one! Yummy! I love simple dishes like this! Very delicious too! I have never had Orange Roughy. Love this dish! Simple and delicious! I love tilapia for it's mild consistent flavor. I can always count on my kids eating it. This is a recipe I will definitely save for a future meal! Thank you so much for all the wonderful comments. And thanks for being a part of Christine's Pantry. Yum - I love tilapia - it is so versatile and healthy! Great suggestion! Can't wait to give it a try.